You are able to upload custom thumbnail galleries to your photo and video galleries. By default, image galleries will use the first image uploaded as its thumbnail cover. Video galleries will display a default video images for video galleries that do not have a custom thumbnail. 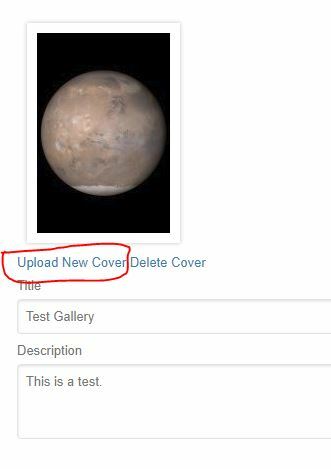 To upload a custom thumbnail cover to your gallery follow the steps below. Access your gallery page clicking on the Gallery Icon on your profile page or selecting Gallery from the drop-down menu under your avatar in the main menu at the top of the site. 2. Select the gallery that you wish to upload your custom thumbnail cover to. 3. Select EDIT from the menu just above the media listing. 5. You will see details about your gallery including the status, current thumbnail cover, title, and description. Click the Upload New Cover link below the thumbnail image. 6. Select the image you want to be the new cover image for your gallery from the file browser and press open. You’ve now uploaded a new cover to your gallery.